Grass founder is commonly seen during the spring months when the days are sunny and warm, the nights are cool and the grass is growing rapidly. Simply put, founder occurs when there is a disruption of blood flow to the hoof and/or toxic endotoxins flow to the laminae of the hoof. 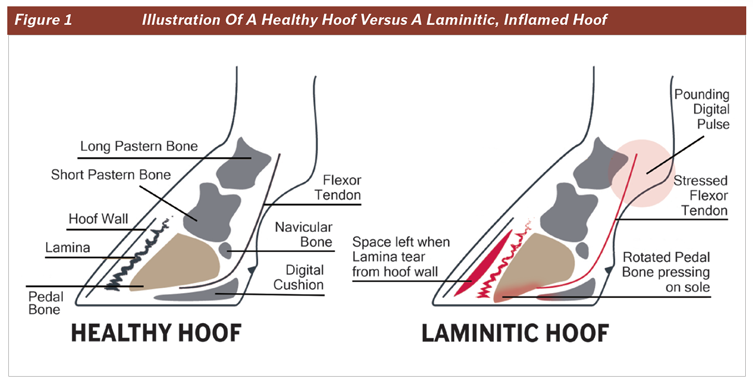 Laminae are the structures that secure the hoof wall to the coffin bone. 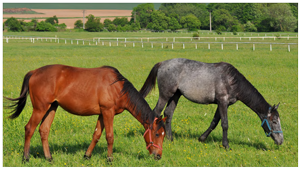 When the laminae are exposed to endotoxins, as seen with grass founder, or there is a disruption of blood flow, as seen with laminitis, they become inflamed. Inflammation leads to a weakened laminae and eventual tearing of the support structure necessary to keep the coffin bone in place (Figure 1). When this happens, the coffin bone rotates downward, causing pain and, in severe cases, can even puncture the sole of the hoof. If a puncture occurs, the prognosis is poor and the horse is almost always euthanized. What Is In The Grass That Leads To Founder? Rapidly growing, new grass has highly soluble carbohydrates, particularly fructans. Grasses store energy in the form of fructan in the stems, leaves and seed heads, especially during the spring when the days are warm and sunny and the plant gets more energy than it can use. This stored fructan is then used on cloudy days or at night to continue growth. Therefore, the amount of fructan found in grass is usually lowest just before dawn and peaks around noon. When horses ingest large quantities of fructan, it can stimulate an overgrowth of bacteria in the large intestine. These bacteria then produce toxins, or endotoxins, that wind up in the bloodstream, eventually reaching the laminae of the hoof and causing inflammation. How To Treat And Prevent Founder? Unfortunately, there is no cure for founder. Supportive therapies include the use of anti-inflammatories and pain medications combined with mechanical hoof support (wedges or sole inserts) and stall rest. A horse that has foundered in the past is particularly susceptible to founder again, so preventative measures should be implemented. Pasture management is key to preventing founder, as the threat is found in lush, growing pastures. Avoid turning horses out on pasture that has been grazed very short during the winter, as these grasses experience rapid growth and high levels of fructan once the weather warms and days lengthen. It is best to keep easy keepers completely off of first spring pastures until growth has slowed and the grass has produced seed heads. It is recommended to introduce horses to spring pasture gradually. Letting your horse fill up on hay before turnout or even putting a grazing muzzle on your horse are some ways to minimize the amount of pasture consumed. The key is to limit fresh pasture consumption until the grass growth has begun to slow down. Overall, the easiest way to treat founder is to prevent it from happening in the first place. Providing a well-balanced diet year-round gives your horse a better foundation and will support them if/when they face a challenge. Crystal Creek® is here to help you design customized diets to fit your horse’s individual needs. We have Foundation Feed that gives your horse quality protein and, when mixed with the appropriate Crystal Advantage® Equine Mineral and hay, provides your equine counterpart with a complete and tailored ration. Give our knowledgeable and friendly staff a call today to discuss how we can optimize your horse’s nutrition plan.